This tag is my entry for the current IndigoBlu Challenge - Monochromatic. I've been meaning to have a go at the ombre effect for ages (yes I know I am a bit behind the times!). 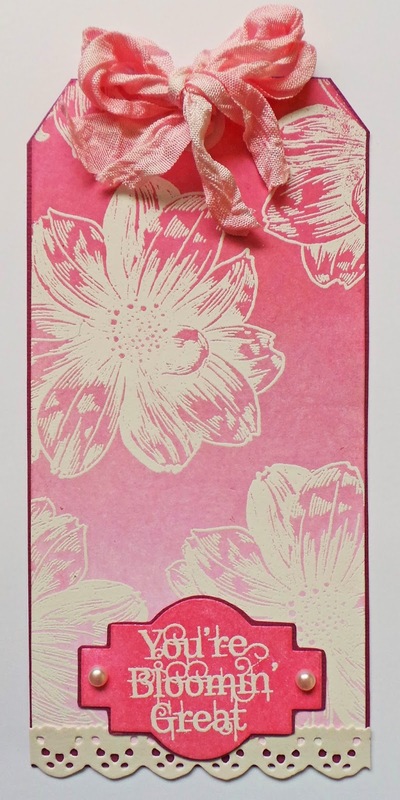 I used three pink shades of Distress Ink (Spun Sugar, Victorian Velvet and Worn Lipstick) over a white embossed resist using the Bloomin' Great set. This tag is for a very dear friend who's been a total star over the last few difficult months. I love your pink tag - such a joyful spring colour palate! Hi Katy, this is beautifully done, and you aren't so behind, I haven't tried the ombre technique properly yet! Hope things are better for you too. Thanks for joining us in the Indigoblu challenge this month, good luck. Hi Katy, not sure if my comment will post twice now, got an error. Hope things are better for you, thank you for joining us in the Indigoblu Challenge this month, your tag is lovely, and not so late, I haven't tried the ombre effect properly yet!